Europe at Night- Photo Series | Travel? Yes Please! Europe at night is absolutely stunning! All of the important buildings and monuments are illuminated, creating a romantic feel to whichever city you happen to be in. I thought some cities, like Budapest, were actually more beautiful at night when everything was lit up so prominently. Taking night pictures quickly became my favourite thing to do. I don’t like to stay up late (at all), but in Europe I regularly found myself out and about past 2:00 am taking photographs. I had never attempted night photography before this trip, so was learning as I went. The number one tip I can give you, is to use a tripod! A tripod is a must for taking photographs at night- it allows you to slow down the shutter speed and capture all the beautiful light! I was always amazed at how taking a long exposure would capture colours in the sky my eyes didn’t see. I was hoping to get night photos of every place we visited during our five weeks in Europe, but wasn’t able to because of the rain that kept plaguing our trip. Here are a few of our favourites from the places we were able to get out and explore after dark! Seeing the Eiffel Tower at night is one of the most romantic things to do in Paris. Here are more photos of Prague at night. 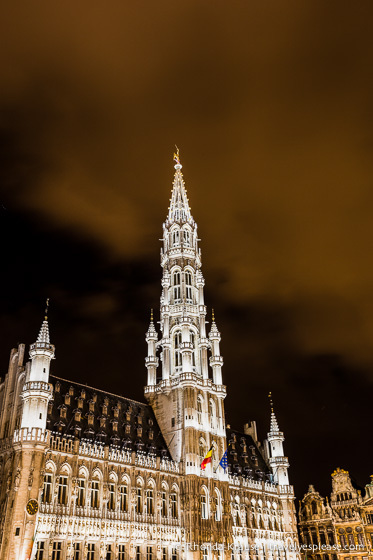 If you would like to learn more about these places, plus others we visited on our five week honeymoon, visit our post Five Weeks in Europe: Our Itinerary’s Hits and Misses. Frank - Fantastic photos! Love the photo of Nuremburg.